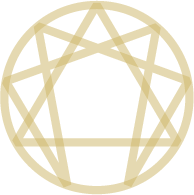 The EnneaCross™ consists of the integration of two powerful and ancient symbols that reflect the spiritual journey and transformation. The Enneagram is a framework that both illuminates specific ways nine versions of the ego structure stand in opposition to the authentic mystery of our Beingness; and points to the truth of our Essential Nature. The cross is a cross-cultural archetype that represents the intersection of our finite and infinite natures. The horizontal line represents personality, time as a linear experience (past, present and future), and the material aspects of life. The vertical line represents the Infinite, the Eternal Now, and the Embodiment of Being. The intersection of the two dimensions brings together the human and divine Heart, the source of transformation and non-dual living. The integration of the two symbols, the EnneaCross™ offers insights into the deeply held dimensions of the ego that keep us feeling stuck in the sense of separateness and it invites us to open to dynamics that support our unfolding.Rather than offering a system for identifying one’s ‘type,’ the four crosses within this symbol offer a process to guide our spiritual growth. ‘Discovered’ in 2013 by colleagues Diana Redmond and Roxanne Howe-Murphy while preparing to deliver a session at the International Enneagram Conference, the EnneaCross ™ has since been presented at additional conferences, workshops and retreats. 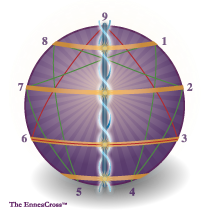 Roxanne’s retreat series called “Beyond Duality” are based on the EnneaCross™. To stay updated on opportunities to work with the EnneaCross™ and learn how this new body of work continues to emerge, join our list.